The best way to “Drink in the History” of Saint Augustine is with an adult beverage and a fun tour guide. Your licensed guide will entertain you with Spanish and English drinking customs, history of Saint Augustine and even the history of each pub that you visit. On this 2.5 – 3 hour all inclusive tour you’ll be offered premium, craft and local beer, sangria, wine, soda or coffee. Your Tour Includes: One beer, wine or sangria at each stop. Your tour will begin promptly at the time stated above. Please arrive 15 minutes early in order to meet your guide, receive your tour stickers & order your first drink prior to the tour beginning. During Nights of Lights (Nov 23-Dec 31) We add Holiday History tour our normal tour. Look for the Nights of Lights Historic Pub Crawl when booking your tour during this time. Our paranormal investigator will take you on a fun-filled paranormal investigation of some of St. Augustine’s haunted bars and taverns. Learn to use real paranormal investigative equipment as you navigate the streets of this historic city on this creepy haunted pub crawl. You’ll learn the true history of each place as well as real experiences that have happened on ours and other tours that have visited each place. We buy your first domestic draft or house wine and you’ll receive discounted drink for the rest of the tour for a total of 4 pubs! On this 2.5 – 3 hour tour you’ll learn about the spirit world from our licensed tour guide and local paranormal expert and taken to pubs and taverns that the locals like to frequent. One welcome domestic beer or house wine. During Nights of Lights (Nov 23-Dec 31) We add Holiday History to our normal tour. Look for the Nights of Lights Holiday Spirits Paranormal Pub Crawl when booking your tour during this time. Drink with a Real Pirate while they regale you with adventurous tales from the golden age of piracy! We buy your first domestic draft, cider, or house wine on this tour and you pay for drinks for the rest of the tour for a total of 4 pirate approved pubs or taverns! This tour is available for guests 21 years of age or older. Sorry, we cannot allow anyone under the age of 21 on this pub crawl. Please be prepared to show proof of age at each establishment if under the age of 35. This Pirate Pub Crawl will begin promptly as stated above. We ask that you please arrive 15 minutes early in order to meet our representative to receive your tour stickers and collect your clue packet. Ready to add a little Romance in while you “Drink in the History” of Saint Augustine? The best way to do that is with an adult beverage and a fun tour guide. Your licensed guide will entertain you with Romantic History, Spanish and English drinking customs, history of Saint Augustine and even the history of each pub that you visit. On this 2.5 – 3 hour tour you’ll receive one domestic draft or glass of wine at the starting location and some drink discounts along the way after that. Your Tour Includes: One domestic draft or glass of wine at the first stop. And some discounts along the way. Available only during Valentine’s Day Weekend. Get your tickets to the best way to Kickoff the Celtic & Irish Season in St. Augustine. Your licensed tour guide will take to you 3-5 bars and pubs in St Augustine as we tell you about St Augustine’s rich Celtic history and some of the drinking customs of the day. We’ll have a toast for you at each bar just to get you into the Celtic tradition! Fun give-aways and drinking games to get your weekend started right! Your tour will include a welcome domestic draft beer or half glass of wine and some discounts at the pubs, bars and taverns that we visit. Don’t forget to tip the bartenders and waitresses. Offered monthly or for Special Occasions. 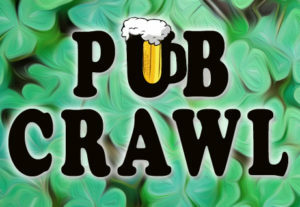 Check below for find Pub Crawls that are great for your celebrations. Birthday Parties, Bachelor Parties, Bachelorette Parties, or just a fun private party with friends. Tips to the Tour Guide is included in the price for all private tours. Ask about AAA, AARP, Military and Florida Resident Discounts. Call or Text 904-392-7137 for more information.. ROMANTIC PUB CRAWL – Offered yearly during Valentine’s Day week but also great for Bachelorette/Bachelor Parties, Pre or Post Wedding Groups or Anniversary Celebrations. Learn Romantic History and St. Augustine History as you are taken to some of the local’s favorite pubs and taverns in St. Augustine. Tour includes One Glass of Beer, Glass of Wine or Glass of Sangria at each of 4 stops. NIGHTS OF LIGHTS PUB CRAWL – Visit some of the beautifully decorated bars, pubs and taverns as we tour the beautiful Christmas Lights of St. Augustine. Named one of National Geographic’s Top 10 Places in the World for Christmas Light. A fun way to see the lights, learn some of the history and legends of the holiday and history of St. Augustine! HOLIDAY SPIRITS PUB CRAWL – Learn about the spirits that still haunt St Augustine even around the holidays. You’ll even learn some holiday history during this 2.5 hour tour. HISTORIC SCAVENGER HUNT & PUB CRAWL SCAVENGER HUNT– A fun way to see the city for groups only. All Pub Crawl/Bar Tours are available for guests 21 years of age or older. Sorry, we cannot take anyone under the age of 21 on these tours. Be prepared to show proof of age at each establishment if under the age of 35.